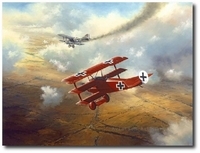 The Roland D.VI was used by Germany during the last year of World War I. It featured unique "clinker built" fuselage contruction consisting of overlapping spruce strakes. Overshadowed by the Fokker D.VII, the Roland D.VI was nonetheless a fine performer. The "D.VIb" model was equipped with the Benz III engine and showed good speed and above average maneuverability. 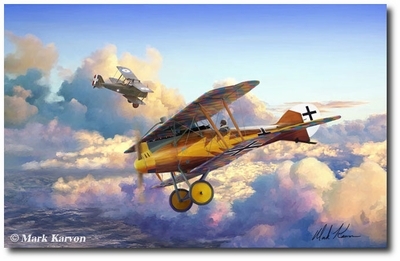 This print features the Roland D.VIb of 18 victory ace Emil Schape of Jasta 33.